O'Sensei practiced Aikido and farmed. 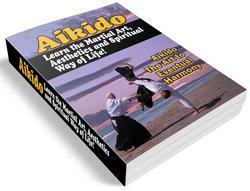 I have been practicing Aikido and organic gardening for over thirty years, and within a short time of beginning Aikido, I started thinking about how to apply Aikido movements to gardening chores. An early article that I published on Aiki extensions work was an article I wrote in 1978 on gardening. add to the physical discomfort. Notice also that my awareness is visibly restricted to the top half of my body and the narrow segment of the world taken up by the hoe and my target. Think back to the four body awareness themes that I discussed earlier. Because space is limited, I cannot go into full details about how I teach fullness as the foundation for powerful, efficient, strain-free hoeing. However, generally speaking, the body should be well-aligned, with full breathing, and power being generated by the legs and hips. There should be a balanced and open awareness of the self in space. 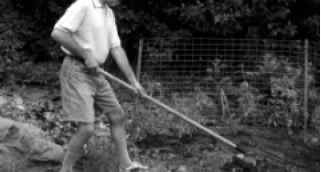 In particular, using the hoe makes use of the rowing exercise and is very much like using the Aikido jo (short staff). For greater clarity in the photos, I'm using the hoeing movement I'd adopt if I were chopping through a particularly stubborn weed with thick, strong roots. Hoeing ordinary smaller weeds would use the same movements but in a lighter, shorter form. Having raised my hoe (photo #2), I'm supporting its weight with my legs and hips. Notice that my upper torso and arms are placed directly above my pelvis and legs. Notice also that my awareness is much more evenly dispersed throughout my whole body and the environment around me. In photo #3, I have finished the chopping motion with the hoe, and it is clear that the power comes from the forward weight transfer movement of the legs and pelvis combined with the vertical downward movement of the arms. 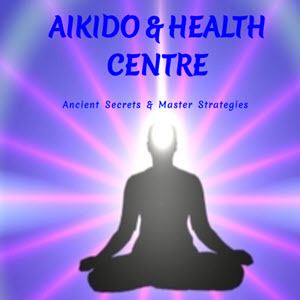 This is derived from the Aikido rowing exercise, but it also makes use of the openness and expansiveness of breath, body, posture, and movement that I described earlier in this paper. The fourth photograph shows the pull back that comes at the last moment of the chopping action and which serves to pull on and move whatever is being chopped. This movement too is part of the rowing exercise, and successful execution of the movement depends on opening and balancing the body. 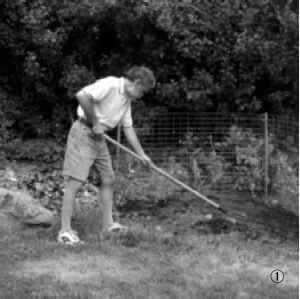 The fundamental principles of balanced body use apply to any gardening chore from weeding to wheeling a wheelbarrow. Beyond that, the same educational approach applies to any daily activity, from washing dishes to driving a car. During pregnancy, many women feel a lot of discomfort. Their backs ache, and they waddle when they walk. Yet most of the discomfort can be eliminated with some brief instruction in body and movement awareness (providing that the discomfort doesn't stem from some medical problem). I usually start by teaching pregnant women how to balance the pelvis in sitting. This new awareness of pelvic balance can then be extended into larger movements such as standing, walking and doing chores. 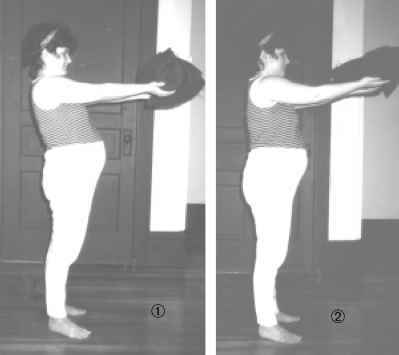 Standing presents some unique challenges to pregnant women since the increasing weight of the developing baby exerts a strong tug on their postures. As the fetus grows, a pregnant woman's body weight shifts forward, and most often the expectant mother throws her shoulders back to balance the weight of the fetus. She creates the characteristic pregnant swayback posture as a means of handling the weight hanging off her forward edge. This increased curve makes the woman's posture biomechanically weaker and contributes to low back pain and the awkward, strained pregnant waddle. However, it is easy to change this, as shown by the fact that all the accompanying photographs of the pregnant woman were taken during the course of one one-hour lesson. To show how to balance the tug, I work with how to best hold a weight at arm's length out in front of the body. When most people do this, they counterbalance the forward and down force of the weight by leaning their head and shoulders back, as shown in the first photograph. However, that creates a swayback curve which compresses the lower back. It also prevents the efficient use of the legs for thrusting to the rear during walking, which is why pregnant women waddle. Instead, sticking the tailbone slightly back and out allows the pelvis and lower torso rather than the shoulders and upper torso to act as the counterbalance to the forward weight (photo #2). This opens and lengthens the back and frees up the hips and legs. It also allows the weight to be supported by the leg muscles rather than by the back. All this results in much easier and stronger standing posture as well as a more efficient and comfortable walking gait. Along with postural improvement in the relatively simple actions of sitting, standing and walking, it is also necessary for pregnant women to learn to apply balanced movement mechanics in the more complex movements of daily chores. This can be anything from using a computer, to lifting children, to driving a car, to vacuuming. 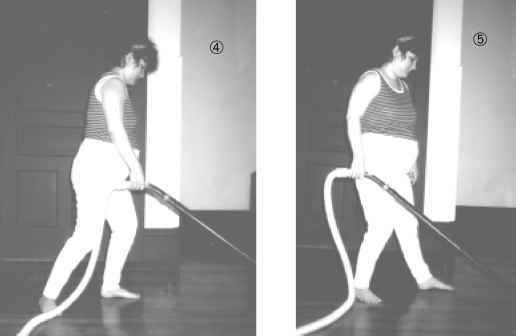 Notice that the first vacuuming photograph (photo #3) is very similar to the incorrect hoeing photograph. In both photos, the mover is bent forward. This is a common movement pattern. Most people in our culture move from their shoulders, arms, and backs. 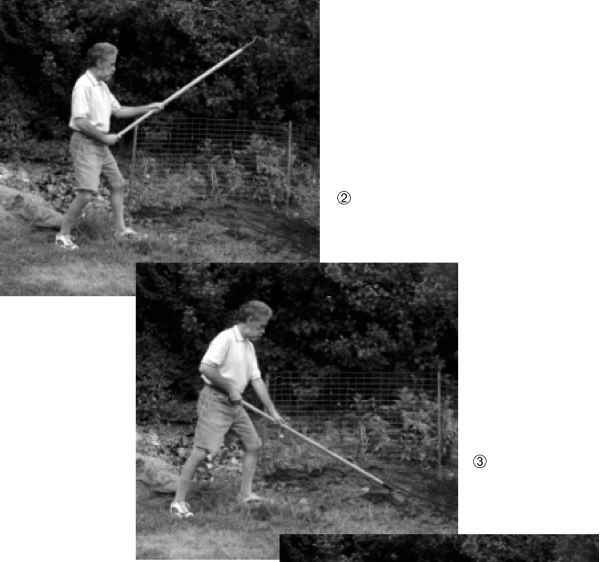 And just as in correct hoeing, the strain-free movement (photos #4 and 5), derives from the Aikido rowing exercise. By making use of the legs to shift the weight of torso, the vacuum cleaner is moved forward and backward, and the back is spared the effort and strain. Without going into detail, I also teach pregnant women ways of dealing with the pain of labor. 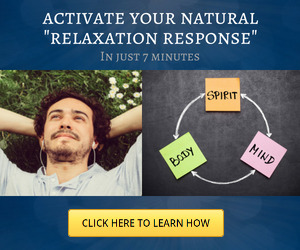 The natural urge is to brace against and withdraw from pain, thus constricting breathing and awareness; but by maintaining soft breathing and body expansiveness, women can reduce pain and become more comfortable with pain they cannot avoid. It is not necessary for pregnancy to be so uncomfortable. It is relatively easy for most pregnant women to learn how to use body awareness to create comfort. Body and movement awareness education is very important (along with exercise programs and childbirth classes) for a safe and comfortable experience of pregnancy.